Pictured is the San Francisco City Hall in 1943, with a "Victory Garden" in front. I was born in San Francisco on December 26, 1943, so right around here, somewhere, is where I first turned up. 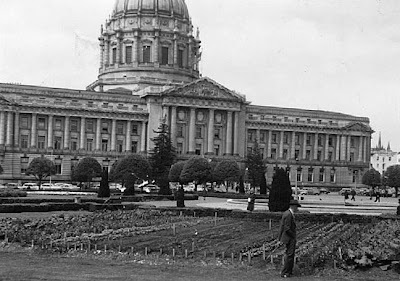 I have always loved San Francisco, and I like the Civic Center area in particular. I also like the fact that this "day after Christmas" birthday of mine has helped to minimize my exposure to embarrassing school and office-based birthday festivities. I have a lot to be thankful for. While my birthday this year isn't one of those birthdays with a "zero" in it, it's getting close, which means, I suppose, that I can't really count on having all that many more birthdays to celebrate. I really am grateful for the birthdays I have had so far; and for the one today, and for any others that may be coming along. As one of my favorite songs says, "Gracias a la vida."